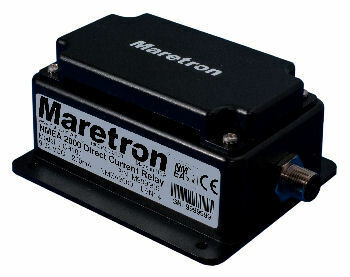 Maretron's DCR100 contains 6 Direct Current (DC) relays, each capable of switching up to 10amps. The DCR100 connects directly to an NMEA 2000® network, so you can turn on and off the relays from any device onboard or remotely running Maretron?s N2KView® software. The DCR100 easily handles resistive DC loads like lights, or inductive DC loads like pumps and motors. The DCR100 can also be used to switch AC circuits using external relays. An added benefit of the DCR100 is that it reports the current through each of the six channels. This allows you to determine if loads are drawing too little electrical current such as burnt out bulbs, or if the loads are starting to draw too much electrical current.